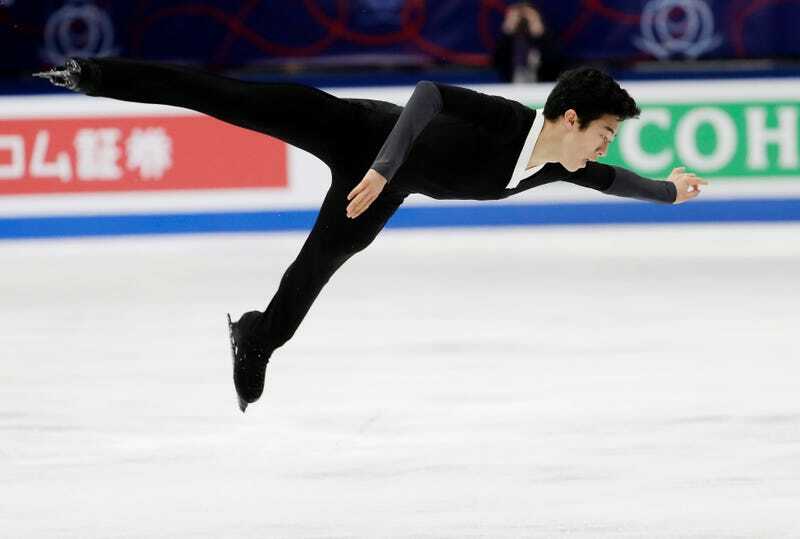 By the time Nathan Chen skated to center ice to start his free skate at the 2018 world championships, he really only need to stay upright and hit one or two quad jumps in order to win his first ever world championship gold. Chen, who entered the men’s free skate in first place, skated last in the final group. Each of the preceding five skaters had fallen, some more than once. Olympic silver medalist Shoma Uno of Japan was in the lead despite falling three times. Russian Mikhail Kolyada was in second with only two falls. And right before Chen took to the ice, his American teammate Vincent Zhou, who had entered the long program in third place, fell three times and struggled with under-rotations on almost every other jump. The men’s figure skating final was, in other words, a total splatfest. Chen did more than manage to not fall in his final performance of the season; he attempted six quads again, just as he had done at the Olympics when he found himself in 17th place after a terrible short program and had absolutely nothing to lose. And as in Pyeongchang, Chen hit those quads, though one of the six was landed with a step out. But unlike at the Olympics, this hit free skate meant that the 18 year old wouldn’t simply redeem himself for poor performances; this time, it meant he’d win the gold. Chen topped Uno’s score by nearly 48 points. And Chen’s title is the first for an American man at the world championships since Evan Lysacek won gold in 2009.